First, we’re brothers. So if you want some history, we’ll have to go back a ways. It was 1955. The Brooklyn Dodgers were about to win the World Series. Our mom worked for the Dodgers. Our dad loved the Dodgers. Needless to say, they fell in love. And by 1967, they had seven kids. Yes. SEVEN. 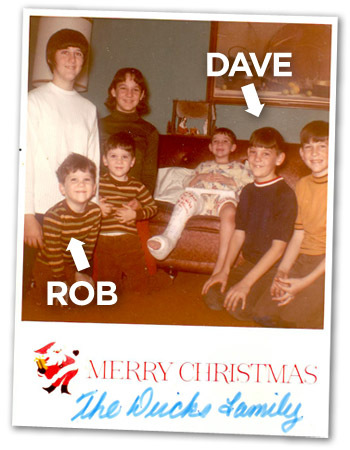 Coincidentally, Dave (the fourth kid) and Rob (the sixth kid) were the only lefties in the family, though everybody had a creative bent. And lefty or righty, we all grew up pretty happy in suburban Long Island. Then Dave started painting and playing the guitar. He was a natural at both, and the perspective of us younger ones changed dramatically. Hey, you can be a dreamer? Cool. So we watched Dave follow his artistic dreams and become an accomplished artist and musician. Rob, meanwhile, went to school for marketing and advertising, but gave it all up (which wasn’t much to give up at the time) to become a graphic designer. In another coincidence, Dave was working as a graphic designer at the same time (cue Twilight Zone music). Fast forward to 1995, and DIRCKS was born. With a couple of clients and lots of fire in our bellies, we struck out on our own and started writing and designing some great work. Word spread, and suddenly AOL was knocking on our door so often we had to hire an extra designer. And another. And another. Pretty soon we were the primary agency for AOL’s massive direct mail efforts — learning a TON about direct response along the way. As the years went by, we greeted all kinds of opportunities to do new things — like rebrand Lowe’s Lumber and Building Supply department (we actually did that? ), or create the multimedia video kiosks for AOL’s entire nationwide retail presence. Or shoot and produce a 4-hour DVD instructing how to assemble a military satellite antenna. And now here we are, 16 years later. A smaller shop, but wiser, still with plenty of fire in our bellies, and ready to embark on another creative adventure. Got one?